Feather Edge Satin Ribbons made from the flexible and high-quality material. It is a perfect elaboration for your gifts, ornaments, hair bows, costumes, favors, and much more. 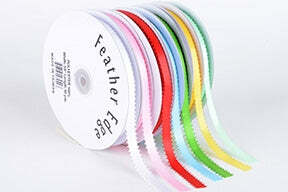 At bbcrafts.com, we offer you wholesale satin ribbon feather; you can buy them very cheaply online. Even a small piece of satin ribbon feather edge can add to the unique beauty of your product. Due to its high durability, flexibility, these fabrics are useful for any creative and artwork; they are suitable for clothing or handicrafts because of their strong and flexible nature. These ribbons can be used for various purposes. You can use them for clothing, for decoration, and also for plain crafts work. You can also use these ribbons in wedding function that enhance the look of your party. These fabrics are available in three forms, and they are the roll, bolt, and Circle through which you can create any theme and decorate your event that gives a fantastic look to your guests.